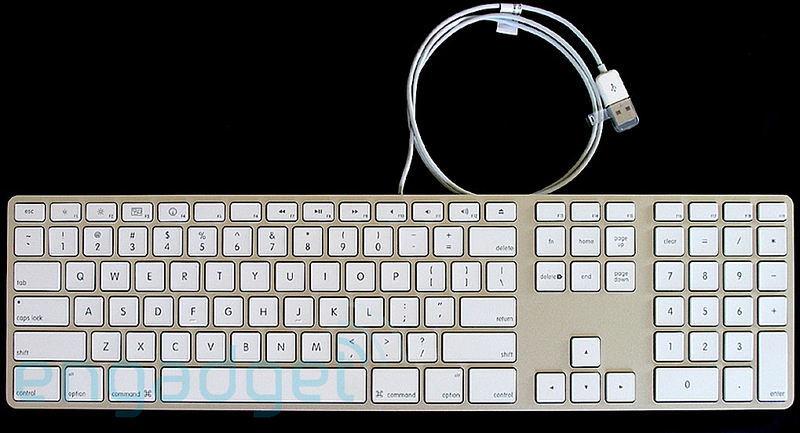 Time for another fun one...what old Apple keyboard is your favorite? Only rule--it must predate USB. This also means any USB-equipped laptop is out. For me, I'm going with the Mac Plus keyboard. It's not too large, has a nice typing angle, and has a very satisfying echo when the keys are pressed. It's also comfortable long-term; I typed a lot of papers on one in middle school before I got the iBook (favorite of the PPC-era). I also like having arrow keys, which is why it wins over the original. Only complaint--no control key. Why not the Extended II like everyone else will probably answer? SIZE. Great keyboard, but too large!!! Apple Extended Keyboard II. There is no other. The Original AEK graces my work desk. A close second is the modern chiclets. Ditto on the Extended II. But it is a might big thing to lug around. So for testing Macs I prefer the Apple Keyboard II. M0116 or M0115. Don't care for the slightly rubbery feel of the M0312/3501 AEK II. It's not as bad as the later keyboards, but, doesn't have the positive feel of the earlier boards. The Plus board is very nice. Reminds me of the early //e keyboard in feel, but, alas, it won't work on an ADB machine, at least, without a custom-built adapter. The other one that works really well for most Macs is the A9M0330 IIgs keyboard. Same feel and layout as the M0116, just on a smaller scale. Maybe not apple, but the IBM Model M space saver hands down. Apple side, I like the keyboard that came with the SE. has the nice tactile feel of the AEK2 but not as big. 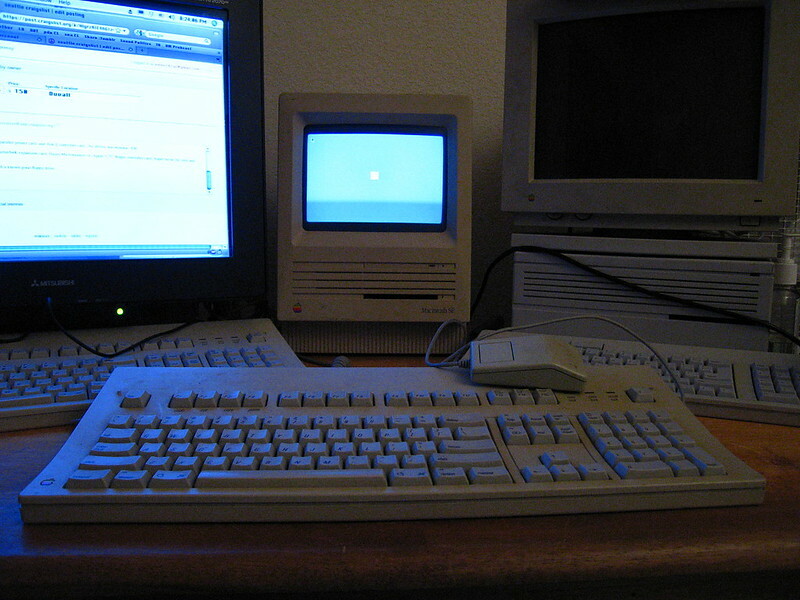 I'll second (or third) the Mac 512k/Plus keyboard, along with the Lisa and Apple /// keyboards. I'm actually a little surprised there's more love for the AEK II than there is for the AEK here. Keyboards... Keyboards are tricky. There's a lot of factors to consider about a keyboard, along with how each individual person uses them. Layout, key switches, travel distance, travel angle, etc. Gaming has different requirements than typing, and even among typing programming and unixy command line use with their special characters have a different set of considerations than say, email and word processing. I personally spend most of my time at a keyboard with a mix of programming, command line use, and email. I do very little gaming (the debugger is the most challenging game of all!) or word processing. I've also found I bottom out my keystrokes, which is a bad typing habit. I haven't used an original AEK in recent memory, so I can't really comment on that. M0116: I enjoy this keyboard's feel quite a bit. The tactile feedback is sufficient, although not as pronounced as some. The angle of the keys agrees with my typing more than the AEKII. The travel distance isn't too bad, and I probably bottom out the least on these keyboards. Unfortunately, the layout isn't conducive my workflow, particularly when switching between the M0116 and another keyboard, like a laptop. Still, it's probably my favorite of the older Apple keyboards. If I didn't switch keyboards so much, I'd probably stick with the M0116. AEKII: The layout and size and heft of the AEKII is great. The tactile feedback is pretty good. The key travel seems typical of keyboards from the era, which is longer than the travel of most more modern keyboards I've used. The one drawback I've found is the angle of travel. Sometimes I find myself typing along at speed, and hit a key, but due to the angle I press the key and the angle of travel, it ends up "sticking" and not being depressed enough to register as a keystroke. That said, they're still perfectly good keyboards, still suitable for modern daily use. Pre-ADB keyboard: They're fun little compact keyboards, although have many drawbacks IMO. They have zero tactile feedback. The resistance on the key is uniform for the entire travel distance. The travel distance is pretty far. Further than any of the ADB keyboards I can recall. Because the travel distance is so high and the keys are so tall, the tend to wobble on the way down. And of course they lack most of the additional meta keys necessary for daily use, like escape, control, etc. Still, they're pretty fun to pull out and use on a casual basis, just not terribly suitable for daily use IMO. PB1400: probably the best laptop keyboard of the era. It had tactile feedback, reasonable travel distance, great angle, solid keys. No real complaints about this laptop keyboard. PB5x0: Tolerable keyboard. It has slightly more travel distance than I'd like, weak tactile feedback, and the angle on it seems slightly wrong to me. I occasionally get key misses on it when I'm typing, which I attribute to the angle of the keys. It's not the keyboard I'd choose to use, but all things considered when choosing a 68k powerbook, it's still my go-to machine. Duos: Worst. Keyboard. Ever. Terrible key angle, terrible feedback, terrible resistance. Everything about these keyboards seems designed to prevent you from actually typing successfully. I have read that the keyboard was supposed to have been improved over the course of the Duo product lifetime, and since I'd love a Duo that could type, I purchased a NOS of one of the last keyboards made for the duos. If there's any difference, it is well below the threshold of tolerance. One thing I've done with some modern desktop keyboards is place o-rings around the key connectors to both shorten the travel distance, and cushion the impact of bottoming out (which I shouldn't do anyway, I know, but work with what you've got, right?). 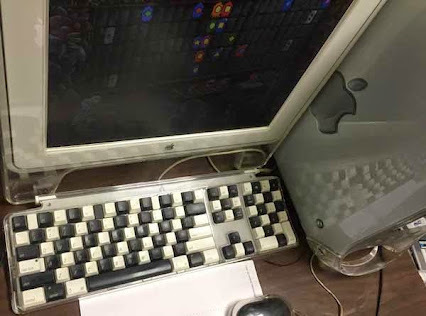 I wonder if that would work with some of the older keyboards. FWIW, I believe powerbook keyboards were ADB up through the tibooks, well after desktops had switched to USB and USB had been shipping on the powerbooks. I think the Powerbooks were ADB right up until the last couple Aluminum Books. I know the first few AlBook generations still used ADB. I prefer the AEK II, but I found I really don't mind the Apple Design keyboards, and they take up substantially less space. They also seem to be less prone to yellowing. The 1400 is still my favourite laptop keyboard, just like Rob. My Duo 2300c, by contrast, is a nightmare. I can't stand the chiclet keys on current Macs. 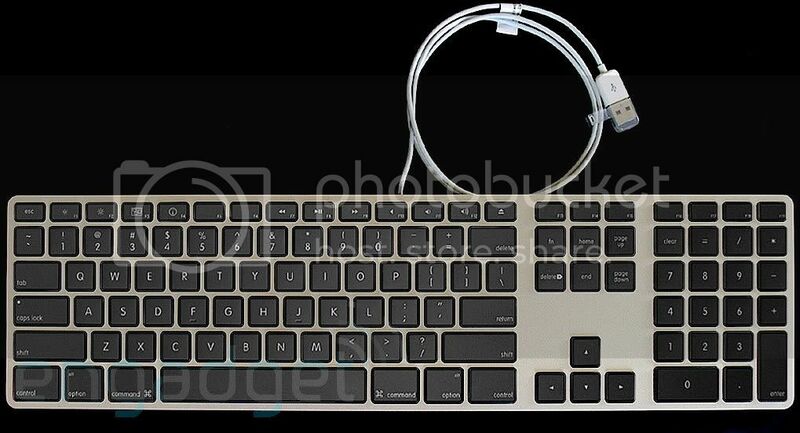 The last decent keyboard Apple made (off topic for this thread) was the USB A1048, IMHO. My favorite Apple keyboard. Except for the transparent "keybooger display" casing. I like the black/acryllic USB boards as well. hell, I did piano keys too haha that's awesome. I've thought about painting the inside of the clear shell white to keep it looking fresh at all times. A bit back to ADB though, were there ever keyboards the size of the Apple Bluetooth keyboard (macbook air sized) for ADB? The original Mac did, but not ADB. Would be cool for my G3 that lives under my desk. I think the closest you'll get to that is the Apple II GS keyboard. I did like the IIGS keyboard as well, but its been so long since I used one because I cant seem to get my hands on one, So i dunno. As mentioned above, the IIgs keyboard feels identical to the M0115/0116. So, pretty tactile with the click that ALPS keyswitches give. Dylan, I think people don't even know about the original AEK. They assume that everything is the AEK II, just like how someone above called the M0116 the Apple Keyboard II, which is nothing like the 0116. Looks more like a bloated IIgs keyboard and has a rather mushy feel to it. Two M0115's, and one M0116. As mentioned above, the IIgs keyboard feels identical to the M0115/0116. So, pretty tactile with the click that ALPS keyswitches give. But the keycap shape is just like the //c so I would say that makes it feel a bit different from the M0115/6. So it's not like a //c because that keyboard has a shorter throw and it's not like the M0115/6 because the keycap shape is different. It's kind of it's own beast. The IIgs keyboard is probably my favorite ADB keyboard, just because of its size. It's the ADB keyboard I keep around for testing machines, so if I'm typing on an ADB Mac these days, it's with a IIgs keyboard. I must admit a soft spot for the original Mac or Mac Plus keyboards even though prolonged typing on one makes my wrists hurt from being 3" above the desktop. I agree about typing on the mac plus or original keyboards, too tall. Just like typing on the C64. and, haha, I had to go back and edit my post, volvo242gt wrote someone said the M0116 and the Apple Keyboard II were the same, went to see who that was. Oh, it was me. I missed the 'OR' in between haha. I love how the M0116 feels while typing, but the Apple Keyboard II is a tad skinnier and fits my small side desk just a little bit better without having to have as much of an angle to how I can use it. It definitely has a mushy feeling though. I'm going to have to find a IIgs keyboard sometime to try it out then. Yes, I know, necropost. However, I am a mech keyboard enthusiast and I collect vintage keyboards in particular. Generally speaking, almost all the non-mech keyboards are unsatisfying. Some, like the Apple Keyboard II are interesting "rubber dome" keyboards as they have isolated cones [more similar to Topre in a way] and wind up being less crap. The Apple Adjustable has a very strange Alps variant and although not bad, are kind weird feeling. The Apple Design, the G3-G5 era, and the aluminium ones since have all been varying degrees of crap or unsatisfying, albeit the newest iteration of their chicket-style scissor switches are actually quite good in feel, the have poor travel and are not great for more than a few minutes at a time before you kind of feel like you are slamming you fingers against a wall, not even getting into the whole problem of being so low profile you can easily miss keys. Anyway, most of the early Mac keyboards are varying degrees of great. Especially the M0116 [aka the Apple Standard Keyboard] (the default one for the Macintosh II or SE series) or the Apple Extended Keyboard I & II. In particular, the ones with Orange Alps SKCM switches are *beautiful* so early M0116s and early AEK1s. They are tactile, butter smooth, balanced-to-light in terms of spring weighting and a joy to type on. The Salmon-colored Alps of the later ones and the AEK2 are very, very good, but just not as great as the orange switches. As such, my favorite is the favorite one I own (and it right next to me on my Mac Classic): the Apple Extended Keyboard... an earlier one with Orange Alps. Finally got one in good condition for a good price locally. I literally can type all day on that thing. I am going to retrobrite it and build an ADB to USB keyboard converter so I can use it on my modern equipment if I choose, but in the meantime, I am using the Classic for my creative writing and journaling and *love* it. If you are familar with more modern mechanical keyboards, Orange (and Salmon) Alps are like of like Cherry MX Brown, but a little more balanced with force, much much smoother, and have a tactile bump worth noting (where Browns feel like gravelly linear switches in comparison). Worth a try, if you haven't. Also, I really love the IIGS ADB Keyboard. Those usually have Orange or Salmon and have a really cool set of keycaps. Also, I like the inversion of the Caps Lock and Control keys [my modified and USB-converted IBM Model M has the control in that space as does my vintage Tipro I use at work]. I wish it had more of a profile, but it is a nice board.